The Pardus Utility Collection (PUC) is an extension for Firefox for improving your gaming experience in the Pardus Online Game. It has been developed by Taised. Since addons policy has changed at Mozilla, they keep rejecting my newer version of PUC despite it has few changed from older one. If you want to use the up to date version, you have to download it from here. This version has no more the bugs version 1.2.3 had, but have not autoupate. Major change since 1.3.0: With new Firefox version you have no more the bottom status table, this mean that you cannot see the "PUC Mapper is on" label. Thus the status bar button has been removed and the switch to enable/disable the mapper has been moved in PUC preference window, under the new "Trading and Mapper" tab. You can open the PUC preference window going in the "Options" page inside pardus and click the "Open PUC preferences window" at the bottom of the page. Also a new button on the interface and a keyboard shortcut to switch on/off the mapper has been added. Since version 0.8.6 you can specify in the options if you want that the clocks will updates itselves or not selecting the checkbox "Ticking clock" in the options. This option is not automatic because it seems that it overload too much the browser. If you deselect the option is enough that you reload the page to refresh the clocks. If you uncheck the "show grid" box, other grid settings will not be considered. You can choose your own color for the grid. Since version 0.8.1 you can choose to always highlight in red the center cell, checking the box "Mark center". This will work also with the "Show Path" option. See also the path settings. Show the path that the autopilot will do when you click on a cell. The color and style (solid or dashed) of the highlighted cell can be set in the options. In the picture below a path (in green) is shown. 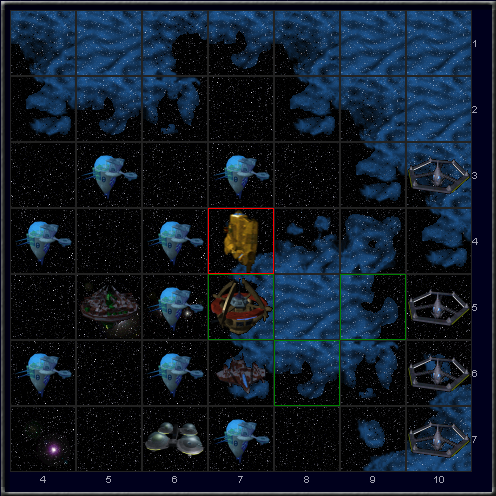 Since version 1.2.2 finally PUC recognise the energy max fields, showing the exact path that your ship will do travelling around max fields. Moreover it understand and tells you in advance if you will have an autopilot failure showing the final cell of the path with a red border (see picture below). Another great feature of the path calculator is that it shows also all the errors that the autopilot does. Indeed you have to know that the pardus autopilot doesn't calculate the best route, but it uses a very simple algorithm that, if the straight path is blocked, it checks always an alternative path first along Y axis. This leads to some errors like the one shown in the picture below. Using the path calculator you can at a glance recognize those errors and save some XP waste. This function ask you a confirmation when you're trying to move being in an ambush or having goods in your mag scoop. In both cases, if you click on "ok" you will move anyway, if you click on "cancel" you won't move. If you are in an ambush AND you have goods in your mag scoop (thing that i suggest you not to make it happens, always turn off your mag scoop when you're in an ambush!) only one confirmation message is showned you: pressing ok will make you break the ambush AND use more APs than normal. The alert for the mag scoop (not the one for the ambush) can be disabled in the options. Since version 0.8.15 an alert will also advice you if when you're moving, you'll go in a non fuel tile and you won't have any fuel on board. When you are on a combat with an opponent (monster or ship), your armor is damaged and you have bots on board, it will be shown a message telling you how many bots will you need to fully repair your armor. "Use X bots to fully repair your armor (A/B)"
Pay attention: To be sure that the number of bots to be used displayed is the right one, you have to set the right maximum values under the options for armor points and armor strenght. Moreover, since version 0.8.12 a number specifing the exact value of hull, armor and shield will be put on the opponent. Be careful that if the opponent has a value over 600, the exact amount cannot be identified and only 600 will be shown. If you are carrying missiles you can specify in the options if you want that the checkboxes of missiles will be automatically selected on PvP or PvNPC screens. Shows you a set of button similar to the one you have in you advanced skills settings both for combat mode and boosts, directly on nav screen. The combat mode buttons are under the clock, the others are between the nav map and the cargo section. The first time you enter pardus you have to set the current combat mode accessing the advanced skills page, this can be easily done by pressing the shortcut you'll have instead of the buttons telling you to "Check current combat mode". The buttons can be disabled in the options, unchecking the "Show combat mode buttons" checkbox. If you've choose to show the buttons but you haven't checked nor "offensive" nor "defensive" under "combat modes" in the current universe, the buttons wont be shown. Obviously the combat mode recorder takes in account the universe you are in. As for the buttons you have in your combat screen, once pressed the button to switch combat mode, you'll be redirected to the advanced skills setting page with already the new combat mode selected and you have just to come back to nav screen. 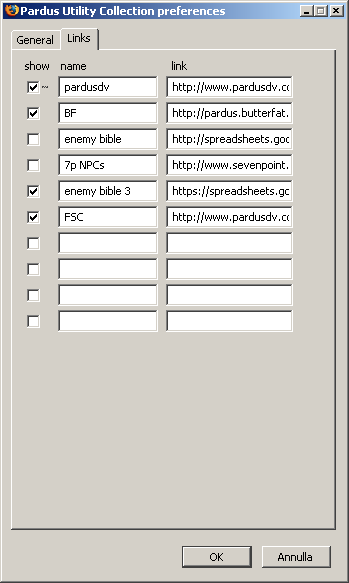 On the bottom of the ambush page you'll have a box where you can save and easily recall your QL. Pressing the "Insert New" button you will be prompted first with the name you want to give to the QL, then a second time with the value of QL. To modify an existing QL you have to simply create a new QL with the same name of the one you want to replace. Adds a link "drop js" inside your cargo screen that loads the cargo page directly inside the nav page, without reloading the full drop cargo page. Once you click on the button "Drop" you will go to the drop cargo page, but with the cargo selected already dropped. This save you a reload. At the moment not all the commodities are droppable with this function, that's why the old "drop" link is still in place, but the most common are droppable. The interaction will be improved in next versions. On the online list page you will get a box where you can enter your quick list for searching online/offline pilots. An easy interface is offered you to promptly add/remove pilots from the list. 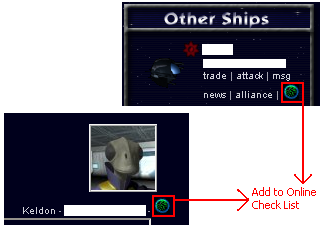 A green square (like the one of friendlisted pilots) will show you if the player you set on the online list is online or not. To add a pilot to the OCL you can put the name in the form on the online page or use the shortcuts in the message window or in the nav screen shortcuts near the ship. PAY ATTENTION: no check is made to verify the name of a pilot, so if you mispelled the name (also with capital letters) you could check the online status of a non-existing pilot! The trade helper code has been imported from Satyap's script, with small adaptations, and improved. This means that if you have already that script installed, you have to disable it to have this function working properly. The function should work correctly also hitting the value to fill in fields, in any case a link "Refresh free space" has been added to check the correct visualization. This feature can be disabled in the options. Selecting the checkbox under "show" you choose if the corrispondent link should be shown or not. If you choose to show the link it will appear with the name specified on the column "name" and clicking on it the page specified under "link" will be opened in a new tab. Trade buttons can be disabled individually for each universe in the options. Each disabled button will become green to let you understand in a glance which skills you could learn. Since version 0.8.22. 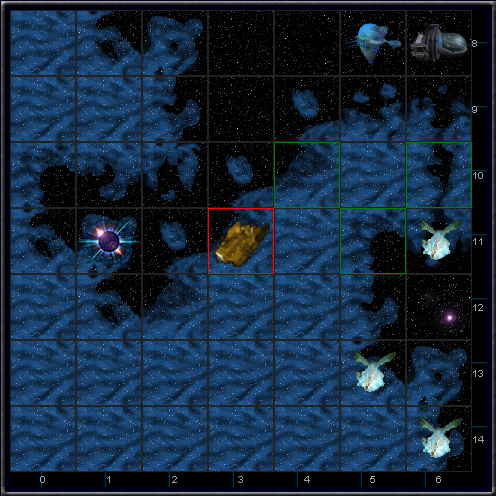 For those having a small screen but still want to use the 9x9 map in the option now there is the possibility to reduce the dimension of the map changing the cell size, reducing from the 64 pixel up to 32 pixel. The difference in using this feature instead of the reduce size in firefox (ctrl+mouse wheel) is that reducing the map will reduce all the label making them unreadable and moreover is very consuming in terms of cpu resources. Log in to pardus, go in the "options" tab inside your account (from the upper bar, the one between "statistics" and "forum"). On the bottom of the table you'll see a table saying: PUC - Keyboard shortcut options. Clicking on the table header you can alternatevely enable and disable the keyboard listener. When enabled you'll see a list of pages where you can add a listener: just click on a page to see the listeners for that page. You can remove a listener or add a new one using the form at the bottom of the table and selecting a letter and an action. After having setting a listener, when you are on the specified page and press the specified keyboard button, you'll make the selected actions. For example setting:"f" to "Fill tank" in the nav screen, you'll fill the tank by pressing "f" in the main screen. Be careful that if you set the same action of the example above in the starbase trade screen for example, by pressing "f" on that page you'll jump to nav screen and refill your tank. Pay attention that the listener to work need that the tab with pardus open has focus: if you open another tab with e.g. google, than come back to pardus tab without clicking anything, probably the listener won't work. You can set an action for main screen to attack pilot 1 on keypress 1 and so on. Now beside each ship in the main screen you'll see a number which acts as an helper to quickly identify which number press to attack that pilot. At the moment the number on pilot list is visible if keypress is enable: thinking if a specific property is necessary. Since version 1.0.1 PUC also tracks all the commodities inside a building each time you enter the trade screen. Commodities are visible on the map of the universe simply going on the building. To disable the commodities tracking you can switch off the automapper and also commodities tracking is disabled. There are a set of adjustment made to building screen since version 1.2.0. First of all the building condition is visible as number and not only as a colored bar (see picture). 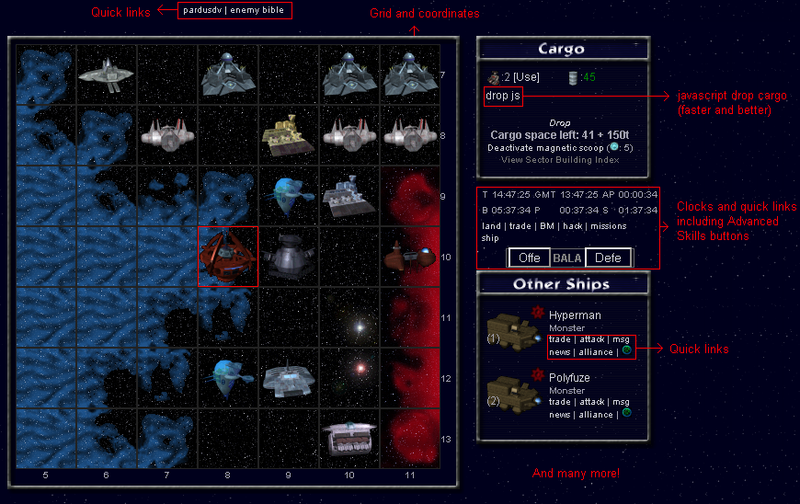 Then a brief summary of your ship condition is displayed on the upper part of the screen. Beware that is just a cached value taken from the last time you've entered the nav screen or the combat screen, thus if someone is attacking you and you didn't came back to one of the page where pardus displays your status, even refreshing the building page you won't see any changes. Moreover, if your armor is damaged and you have robots on board, a form to use some of the robots you have is displayed, identical to one you see on combat screen. 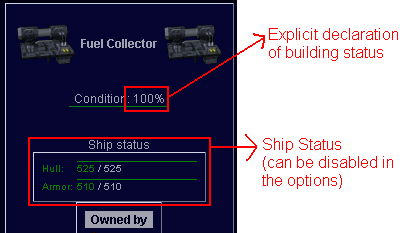 As before the bot amount you have and the status of your armor are all cached values, so it could actually not reflect the real status of your ship. After pressing the "use" button, you'll be redirected to the nav screen. Since version version 1.1.6 a set of helper have been added to the shield charge page. In the options there is a new tab, named "trading", where you can set the max price you want to pay per shield point. If the recharge value is set higher than the one you've chosen, the price is highlight in red and the recharge button is disabled. Moreover, a new row showind exactly the amount of money you will pay to recharge you shield is shown. An example is on the figure. When you change some option, you have to reload the pardus page to see the effects. added a version on the data sent from the mapper so that data coming from older version of mapper won't mess anymore the map. So update PUC to latest version to update your data. alert on nav screen freeze navigation.